Big changes are coming to the restaurant industry in 2016, when a series of new regulations will kick in and force owners to rethink their business models. To cope, many restaurateurs are turning to a no-tipping model that will also see menu prices rise accordingly. Danny Meyer may be the most notable member of the group, but he’s hardly alone. To keep track of who’s taking the plunge, Grub Street will keep this post updated as more owners (inevitably) adopt the practice. Setting the tone for his New York takeover, Noma co-founder Claus Meyer won’t even bother with tipping at his train-station restaurant. The West Village restaurant went service-included and upped menu prices by 25 to 28 percent, though the seven-course tasting menu is up 35 percent to $155. In keeping with its Scandinavian spirit, the Williamsburg restaurant does not accept tips for its pricey, lengthy tasting menu. At the sister restaurant to the critically acclaimed, homegrown chainlet Xi’an Famous Foods, the noodles are now hand-pulled and stress-free, as all employees are paid $12 an hour plus a 15 percent revenue share as of March 27. There’s been plenty of controversy surrounding this pizza place, but everyone seems to enjoy the no-tipping policy that’s been in place since they opened this past summer. The midtown Sichuanese spot is New York’s first big-deal traditional Chinese restaurant to defect to team no-tipping. Prices went up 10 to 15 percent, and servers now receive $15 an hour plus commission based on dine-in sales, while kitchen workers receive bonuses based on dine-in, delivery, and takeout sales. In lieu of a traditional tip, guests pay a 20 percent service charge. 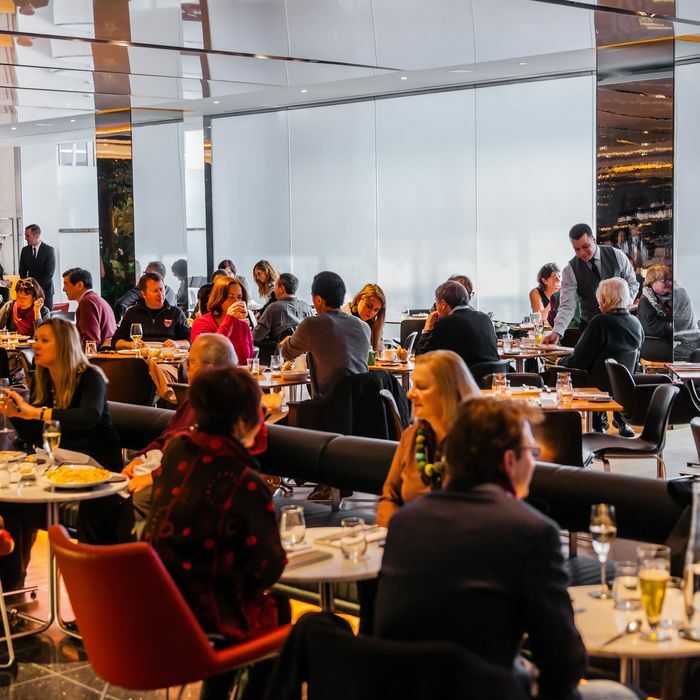 As of September, gratuities were axed during lunch service at Tom Colicchio’s flagship spot. All vegetables, no tips since Amanda Cohen reopened her restaurant early this year. On January 1, 2016, tips were banished and prices rose for the ultra-luxe restaurant’s tasting menu. Since opening in August, the Prospect Heights restaurant has included gratuity in the price of its Italian-inspired New American dishes. At the trendy Gowanus restaurant, the wine is proto-natural, from Georgia, and gratuity-included. The popular East Village Spanish spot nixed tips as of December 14, when food prices were upped 25 to 27 percent, and beverages around 15 to 17 percent. After two decades of accepting tips, the owner pounced on the no-tipping bandwagon in November 2015, and added an administrative fee to checks. The owners of this brand-new Korean barbecue spot in Brooklyn never bothered with tipping, electing to go the way of a 20 percent administration fee right out of the gate. Danny Meyer’s wood-fired pizzeria and restaurant in the Martha Washington hotel followed its big brother Maialino into the land of no tips. On February 25, the Roman trattoria became the second of Meyer’s restaurants to banish gratuity. On December 21, the Michelin-starred Williamsburg restaurant announced that it would go service-included starting January 1, 2016, and raised prices by 16 to 20 percent. Meyer workshopped the no-tipping model at his uptown museum restaurant, which he says led to the restaurant’s most profitable month ever. The rest of his restaurants are scheduled to follow suit throughout 2016. To coincide with a revamp of the menu, the owners of the Long Island City meat palace took the opportunity to go gratuity-free during the first week of March. The Battery Park restaurant is the third Danny Meyer spot to do away with tipping. Since late 2015, the serene acclaimed Williamsburg restaurant hasn’t accepted gratuity during its traditional Japanese breakfast or for its dinnertime tasting menu. As of March 28, the Japanese don’t dig tipping, so the Tokyo-based international izakaya chain will do away with the practice at all three of its New York locations. Ryan Hardy and Robert Bohr’s wood-fired sequel to their hit restaurant Charlie Bird includes service in the price of its pastas, pizzas, and meats. Thomas Keller went service-included back in 2005, though guests still have the option (if they so desire) of giving a little extra. Because the staff should be treated as well as the fish are, the Park Slope seafood shack has served its sustainable seafood and on-trend biodynamic-wine list totally gratuity-free since it opened in early February. The Midtown izakaya did away with tipping in 2014 in keeping with Japanese tradition, raising prices to offset the cost. In May, Andrew Tarlow, like Danny Meyer before him, chose his all-day hotel restaurant as his second spot to go no-tipping. Andrew Tarlow’s Fort Green trattoria made the transition on January 18, 2016, when prices were raised by about 20 percent. The owners decided to adopt service-included prices way back in 2013. The Midtown East restaurant builds the cost of paying its employees into the cost of dishes and says prices reflect total cost. The modern, ultra-fancy Japanese restaurant, where they boil miso soup with rocks from Mount Fuji, opened with gratuity built into the cost of its pricey tasting menu ($150).